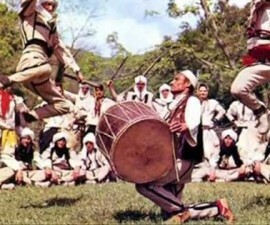 Albania has a rich musical tradition and especially folklore. This is to be expected as the whole Balkan region is well known for its impressive musical heritage. The interpretation of Albanian folklore music varies a great deal from polyphony (songs without instruments) to flute or bagpipe polyphony to other kinds of songs and instruments altogether. Northern Albania uses specific types of instruments such as: lahuta (single string instrument), çifteli, sharki and drums. While in the south iso-polyphony is particularly popular. 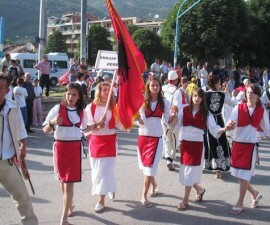 Besides folkloric music, Albania has a rich tradition in urban music from Shkodra (jahre songs), Elbasani, Korça (serenades) Vlora, Përmeti, Leskoviku and Delvina (saze songs) and Berati. 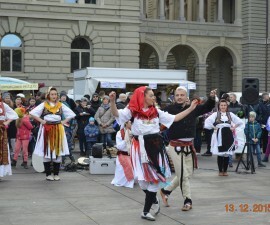 Festivali Folklorik GjirokasterThe main folkloric activities are the National Folklore Festivals usually held in the museum city of Gjirokastra. Albania also has a rich tradition of dances with a great variety of choreography and costumes mainly depending on the origin. There are epic as well as lyrical dances. Particularly famous for their elegance, rhythm and drama are the dances of Rugova, Tropoja, Devoll, Lunxhëria, the couples’ dance of Rrajca, lab dances and the çam dance of Osman Taga.